Origin and Habitat: Euphorbia millotii grows only in the vicinity of the coastal Lac Bleu, near Vohemar, south of Iharana, northeastern Madagascar. Habitat and Ecology: Coastal forest and coastal shrubland. Euphorbia millotii, grows mainly in sandy soils in the shade of dense, windshorn bush. In the environment of the Lac bleu there are also big stemmed Aloe peyrierasii. Its habitat is highly threatened by human activities, habitat degradation, fire, habitat clearing for charcoal. It is also collectied for the horticultural trade, increasing the threat of extinction in the wild. 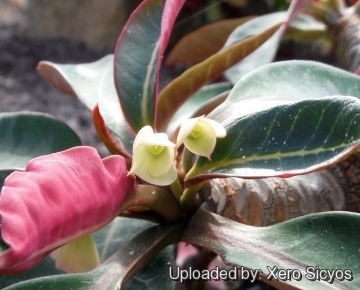 Description: Euphorbia millotii is a unique charming succulent scrublets up to 80 cm tall with round, initially greenish red, later grey, lignified branches. The cyathia (flowers) are nodding, encircled by the ample, dark, wine-colored cyathophylls, which unfold only slightly. The foliage, which appears after the bloom is green with rich purple undersides at first. Derivation of specific name: This plant is named for the French zoologist Prof. Millot. Stems: Richly branched from the base, rebranching above. Branches cylindrical, decumbent reddish-green when young, but covered with a silvergray splitted cork-mantle with age and covered with large half-moon-shaped leaf-scars of the deciduous leaves. Leaves: In tufts at the stem-apex. Blade lanceolate-obovate, 6-12 cm long, and 3 cm across, acuminate, green above, purple-red beneath. Petiole red, to 8-12 mm long. Stipules reduced to minute, scarcely visible, bristles. Inflorescences (cymes): Simple in the leafless branches in subterminal position and are dichasias with mostly 2, short petiolated cyathia. Peduncles to 5 mm long, pendent. Flowers (cyathia): Small pendent and enveloped by a cup-shaped pair of pale-red to green bracts (cyathophylls) approx 8 mm long and 10 across, reddish, short acuminate completely covering the cyathia. Nectar-glands saucer-shaped, yellow-green. Ovary subsessile. Similar species: Euphorbia millotii is closely related to Euphorbia ankarensis. It has the same type of inflorescences with hanging, bell-shaped cyathia and cyathophylls, but its stems are densely branched from the base. It is also similat to Euphorbia lophogona but more branched, branches cylindric, without the ridges of spiny stipule. 1) Haevermans, T. 2004. Euphorbia millotii. The IUCN Red List of Threatened Species 2004: e.T44399A10892005. http://dx.doi.org/10.2305/IUCN.UK.2004.RLTS.T44399A10892005.en. Cultivation and Propagation: Euphorbia millotii is an attractive, but slow growing species available from several sources for enthusiasts. 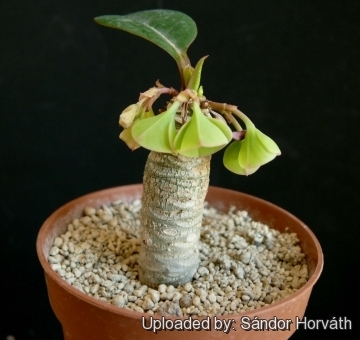 Like all the other species from Madagascar, this plant needs a temperature of at least 10°C (50°F) in winter and will do better if kept even warmer. An occasional light watering in winter will prevent excess dehydration. Very similar, but more tricky to grow is Euphorbia alfredii, which is more compact and rarely branched. Rare in cultivation. Growth rate: It is a slow growing long lived plant and once established, it will be content in its position and with its soil for years. Exposure: A very very light and warm place in full sun is highly appreciated, but can tolerate moderate shade, and a plant that has been growing in shade should be slowly hardened off before placing it in full sun as the plant will be severely scorched if moved too suddenly from shade into sun. Soil: It does best in a mineral soil, good drainage is essential. Watering: Water sparingly during the summer months and keep dry in winter. In the short growing season it likes ample water and in this period it grows rather quickly, though not for a long time. When not in growth it is killed right away, when given too much water. Frost Tolerance: Tender, it needs frost protection. Recommended minimum temperature is 12 °C or even above. Propagation: It is propagated from seed sown during spring or summer. Germination occurs within 3 weeks. Sowing seed of this self fertile species is the surest method of growing typical offspring and seedlings are in the first season relatively easy to grow. 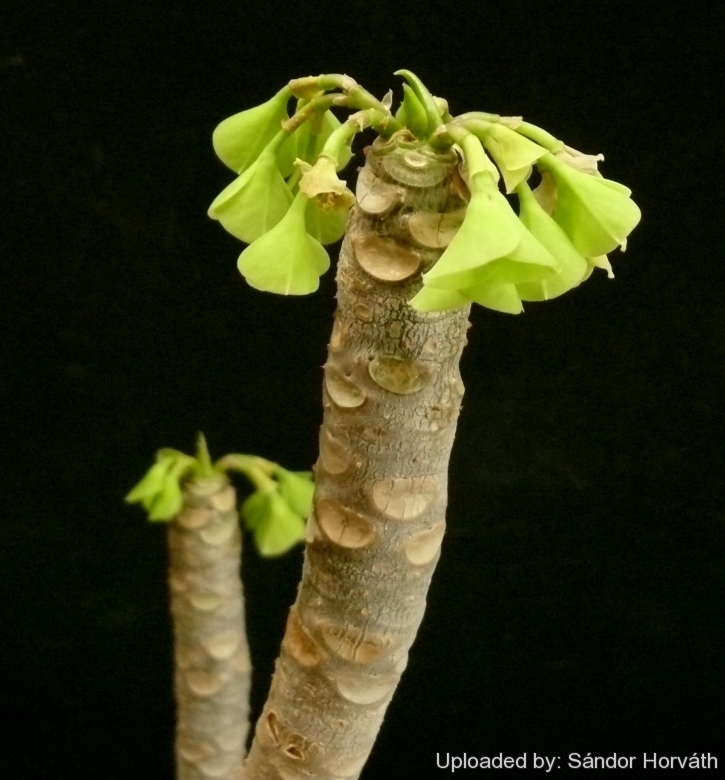 Thanks to its freely branching habit it can be propagated by rooting cuttings of the branches. It can be grafted as well.